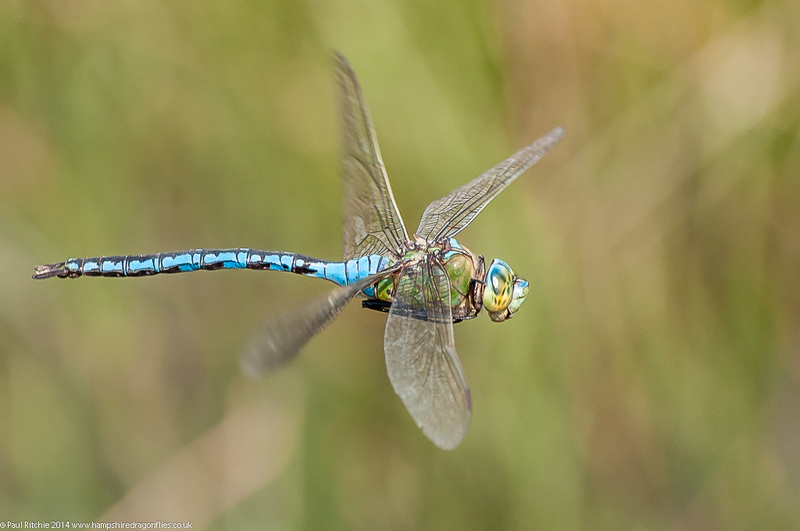 The end of September has arrived with colder nights, foggy mornings and some welcome afternoon sunshine, even reaching a dragonfly-friendly 20 degrees. 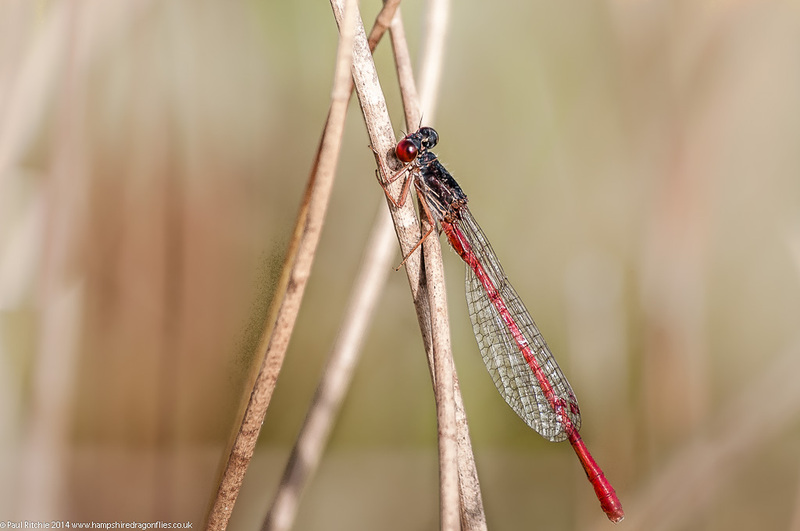 Besides the usual suspects (Migrant and Southern Hawkers, Common and Black Darters) the hardier damsels like the Emerald and Common Blue have continued to show in reasonable numbers, and I even had a Small Red hanging on during one of the more prolific days. 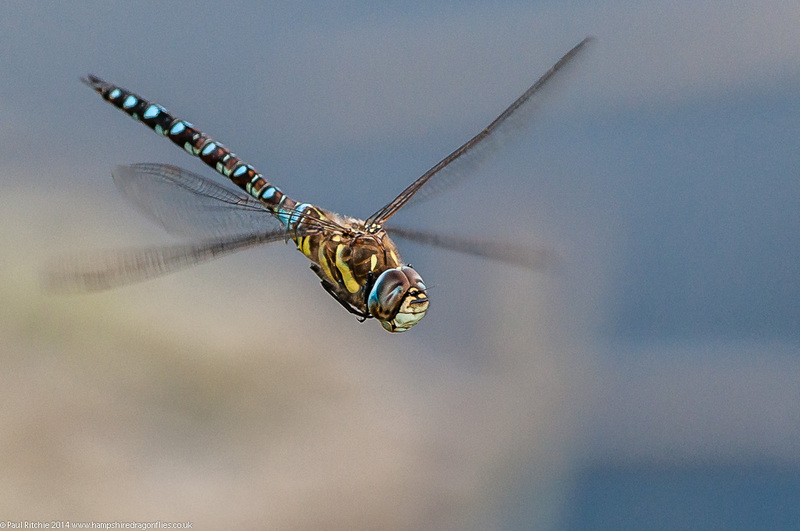 I didn’t expect to find anything but as it happens a few Southern Hawkers were holding territories at opposite ends of the pond, enough to keep me amused for a few hours. As usual the corner around the solitary gorse bush was the chosen territory of two of my subjects; once again engaging in a time-share arrangement and rarely tussling for more than a few seconds. 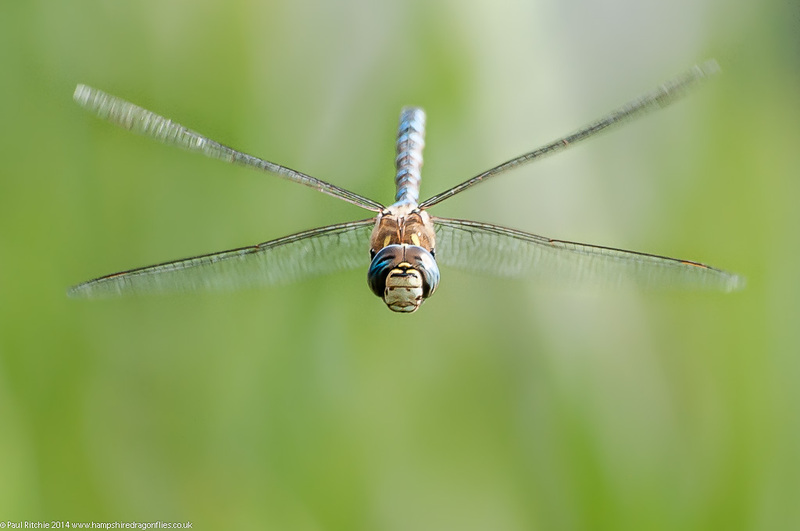 Another of my subjects chose to remain along the northern edge, allowing some rather wonderful and challenging close encounters as he flew along the grassy bank. Although not up to its usual standard, the opportunity to spend a few hours was a fine way to end the season at one of my favourite ponds. Let’s hope it’s recovered sufficiently over winter to provide it’s usual Spring bounty. 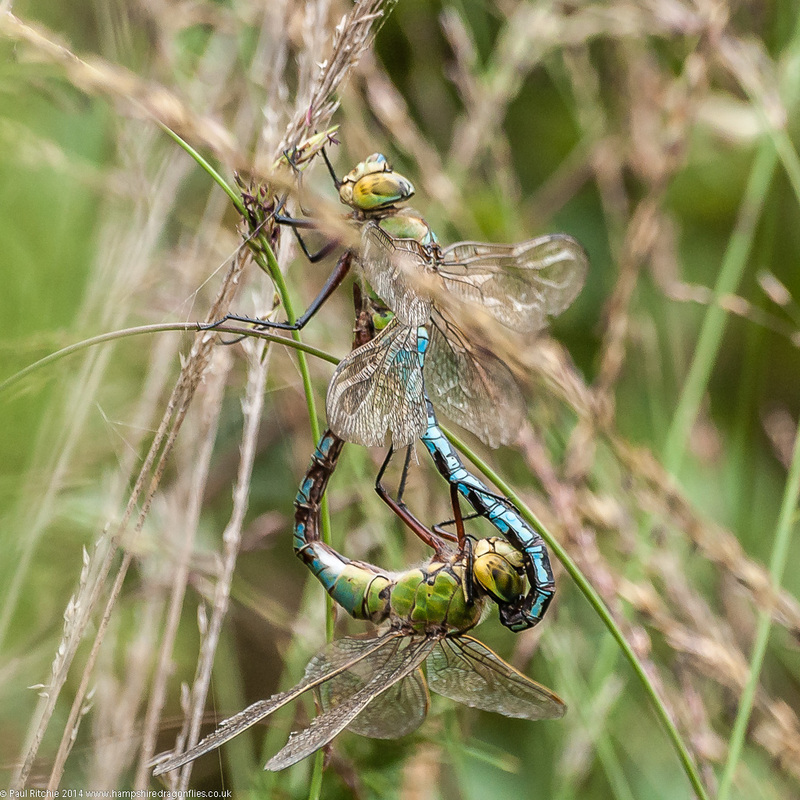 If you look again closely, you can tell the these three Southern Hawkers are all different individuals ‘time-sharing’ the same pond over the course of three hours. A calm and pleasant afternoon was ideal for checking out the pond and boggy pool at Milkham Bottom. Even here the water levels had retreated, enough at least to allow me to paddle across to the island – a guilty pleasure I’ve always wanted to do. This proved to be ideal for grabbing some Migrant in-flight action as a couple were choosing the small reeded area close the the island shore. The ability to choose a low aspect to shoot from allowed a little variation in background, with the far shoreline offering some delightful neutrality. 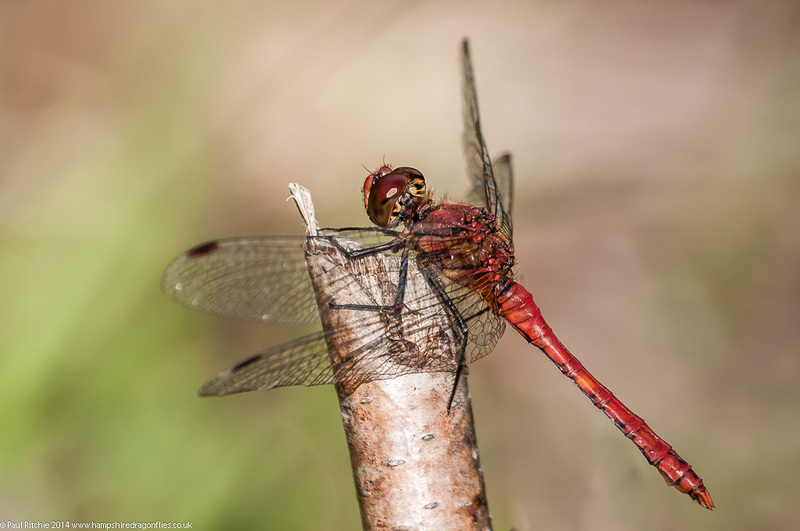 Around the margins there was plenty of Common Darter activity but little else, so I chose to spend an hour at the boggy pool where there were more Common Darters, a few Black Darters – including tandem pairs, some Common Blue and Emerald Damselflies and the surprising appearance of a male Small Red. 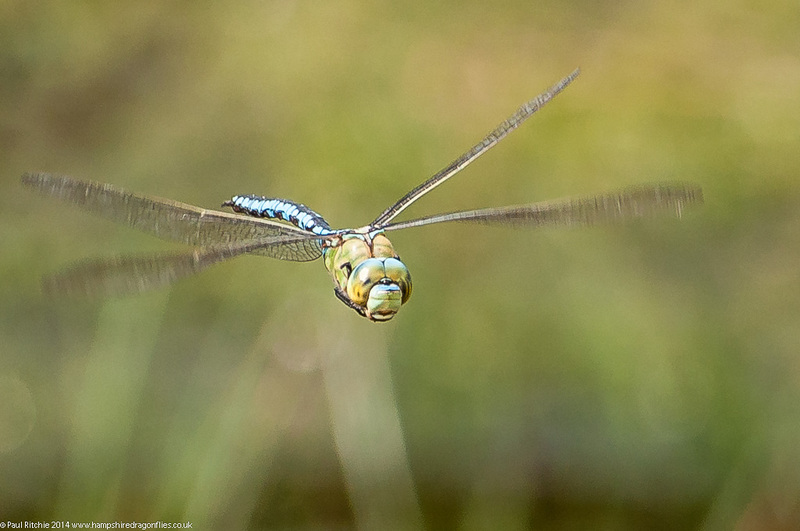 During the hour a female Moorland Hawker flew in briefly to oviposit at one edge, but was spooked at my presence and disappeared never to be seen again. 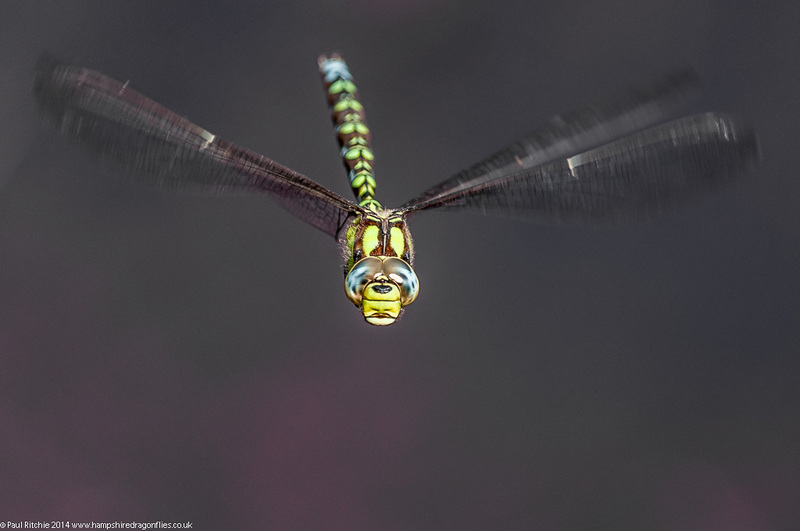 A female Migrant also paid a visit, and the appearance of a male Emperor brought the species total up to eight. Not bad for this late in the season, and possibly the best I’ve experienced here. 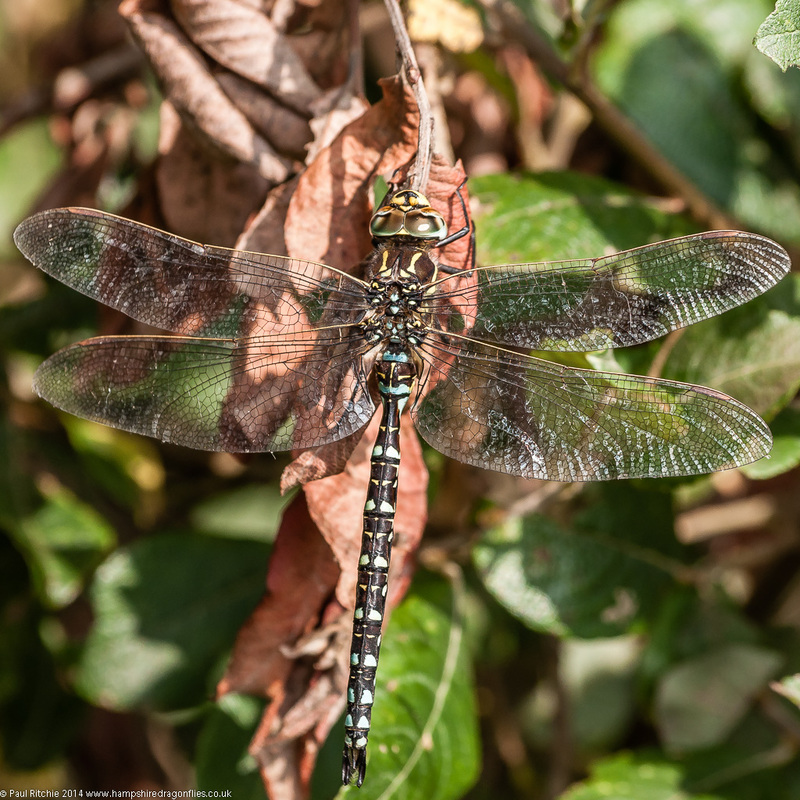 A circuit around the paths, ponds and old railway of Town Common threw up a few Common Darters, a fair quantity of Black Darters and Emerald Damselflies. Over at Ramsdown there were more of the same among the heather and at the ponds. 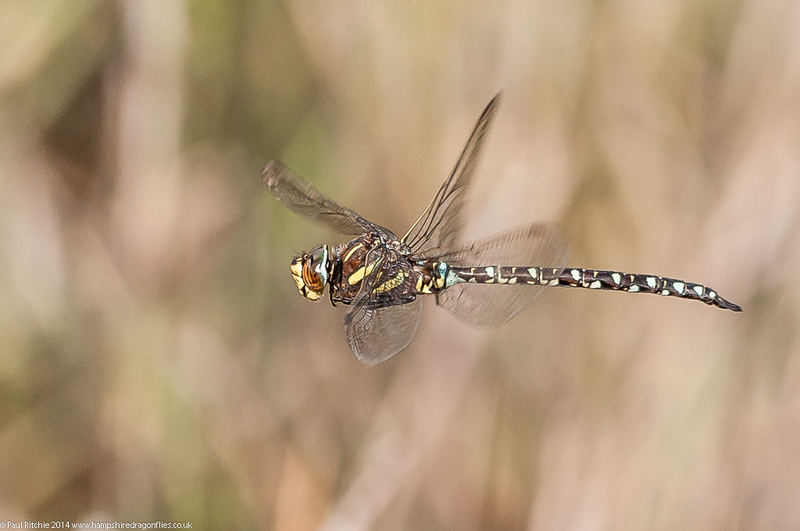 After an hour of the same I was about to give up when a couple of male Southern Hawkers flew in, violently disputing territory with a couple of duckings before choosing a compromise at either end of the pond. On the way home I called in at Milkham Bottom, but by now there was a ribbon of cloud following the south-westerly wind with only the one Migrant and a couple of hardy Common Darters braving the breeze. In many ways I’m grateful for the seasons; knowing I’ll be hungry by the time April comes around rather than getting bored with the same old suspects. 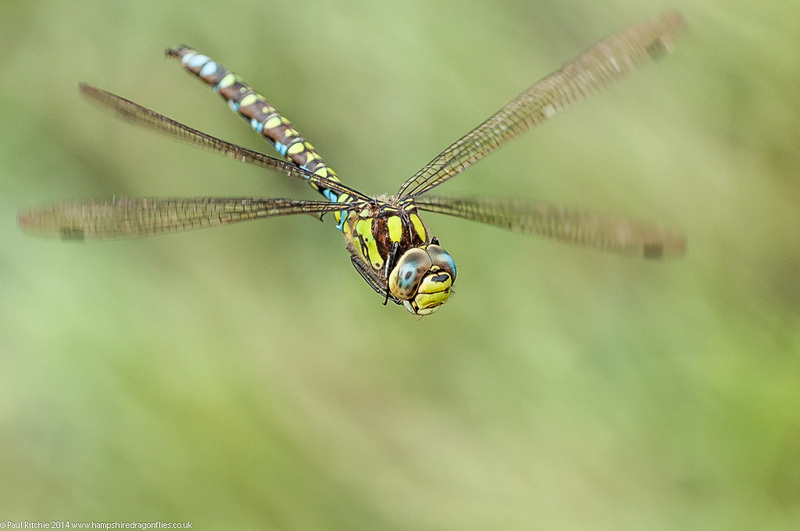 That said I still feel it’s a little too early to give up on dragonflies just yet. September is my preferred time for spending a few hours at a pond, but the lack of rain has rendered most of my favourite watering holes barren. 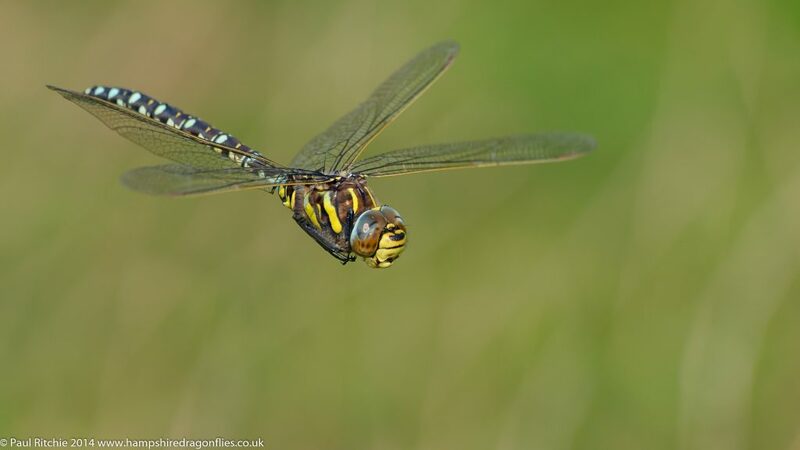 The criminally premature clearing of the meadows at Swanwick has robbed the hawkers of their chosen feeding grounds and they’ve all but disappeared; moved on to more fruitful sites. Still a few possible locations to scout before hibernation kicks in, because, although I’m fanatical, I don’t see the point in searching relentlessly for the odd late straggler just to satisfy statistics. For me the enjoyment comes from the bounty of swarms on a warm and sunny day providing the option to indulge or sit back and enjoy. A brief call in to Crockford on the way to Pennington just in case there were any hawker opportunities. Certainly nothing along the stream except for a late and lonely male Beautiful Demoiselle, still hanging on to his patch in hope. Still, a pleasure to see – and not the last I’d encounter this month. 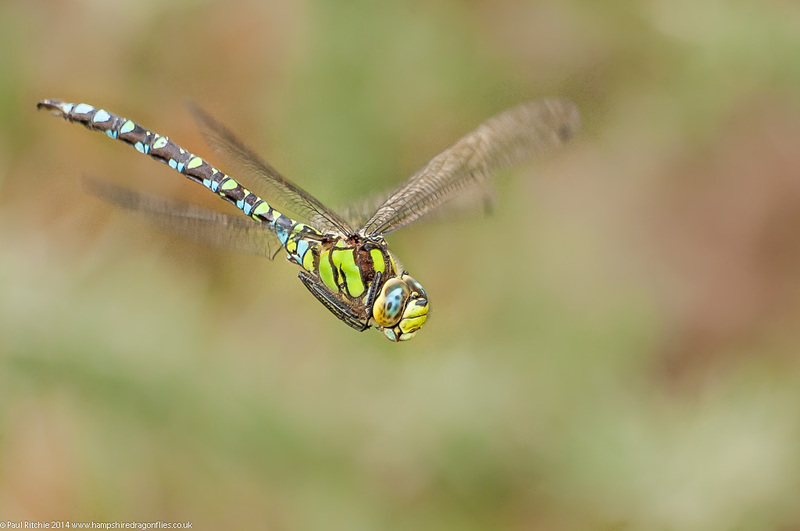 On the way out I had a female Southern Hawker circle me at calf height, but she wasn’t prepared to settle. At Pennington the cast was dominated by Common Darters and Migrant Hawkers, but at least there was a male Southern patrolling a small bay. As I was approaching the exit I attempted to photograph a male Migrant perched in the bramble, but he rose and landed a short distance away to offer a far more pleasing opportunity. I don’t know why I chose Whitten Pond as my next port of call. 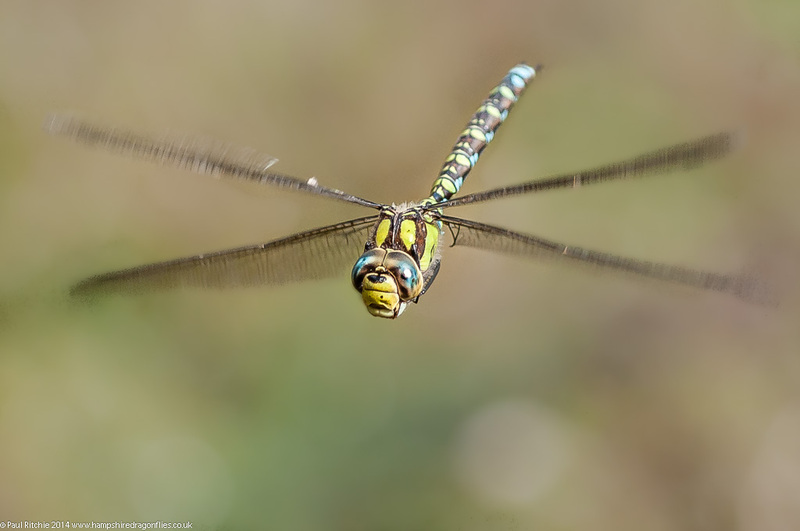 Maybe it was of my first ever Moorland Hawker sighting five years ago along the tree-line, or failing that a good chance to perhaps find a Southern or two perched in one of the many gorse bushes on the path. 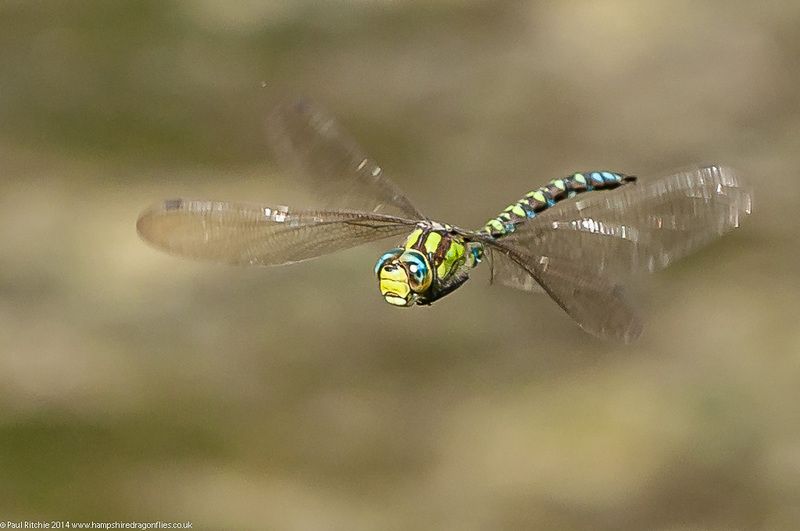 The last time I visited this water body (some years’ back) there were a couple of Brown Hawkers in attendance along the feeder stream, and I was more than a little surprised to find a male here today. I was even more surprised to see him land in the bramble bush opposite. 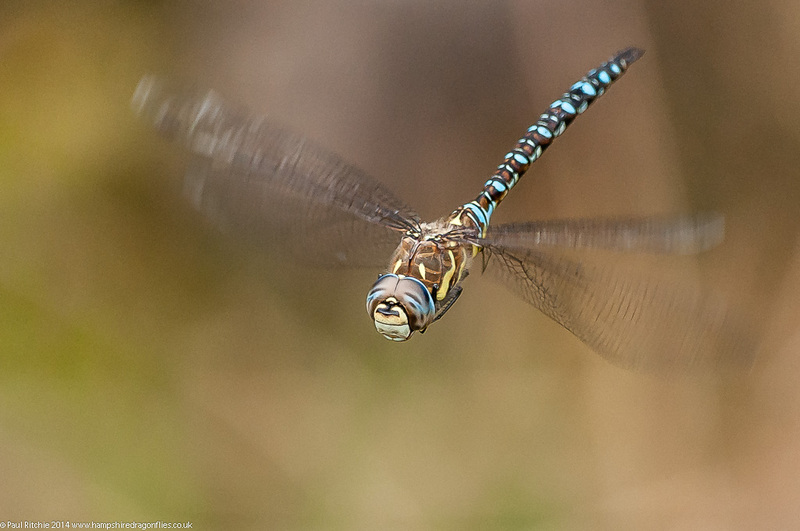 Also patrolling the stream were a male Southern and male Migrant. A pleasing end to the day. 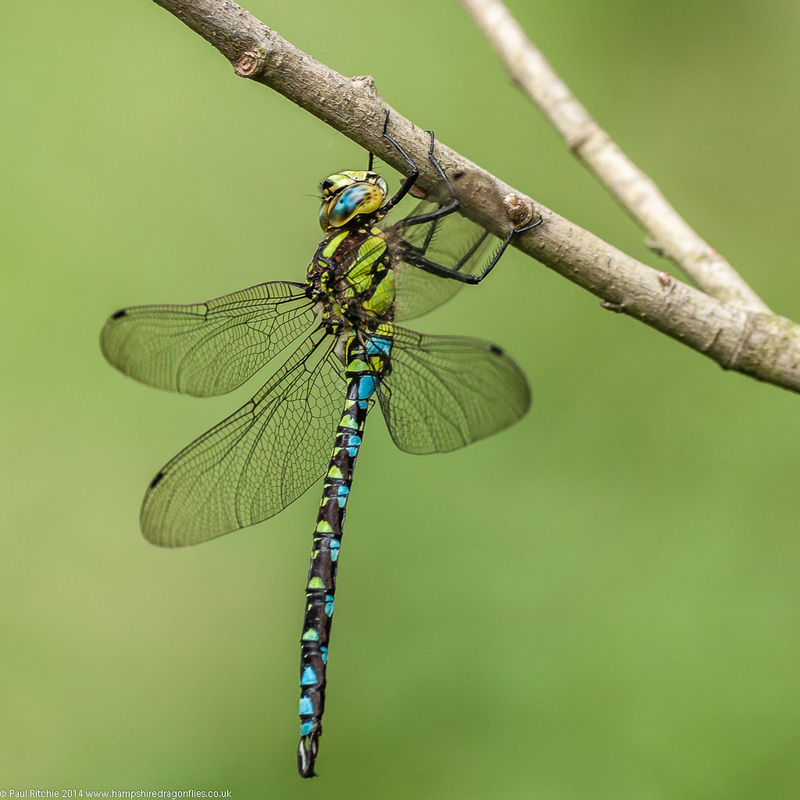 Wednesday was another day which started slow with Ramsdown only showing a few Common and Black Darters and a few tired Emerald Damselflies brightening up an otherwise empty pond. Even the clearing was quiet with no hawkers feeding and only the one perched in the gorse. As I was about to check out the smaller ponds I received a call from Doug who asked if I fancied meeting up in his lunch hour. Sounded like a plan, so neglecting the ponds I took the short drive to meet Doug at Troublefield. Unsurprisingly there were no perched hawkers along the fence, so we made our way to the far corner where there should at least be a few Southern to choose from. There were; four in total. Two choosing to patrol the gloomy channel and one providing some wonderful perched opportunities. I had called into Cadnam Common a week earlier to notice the water levels had increased sufficiently to allow at least some activity, but it wasn’t to be. Neither was it today. 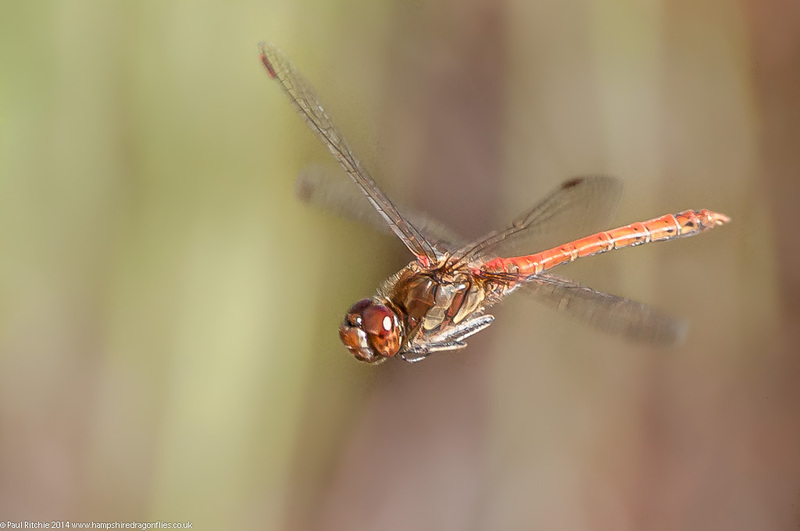 Not even a Common Darter to be seen. Maybe I was a little too early, but surely by 11.30am there should have been sonething? No matter, maybe Milkham Bottom would produce some entertainment? It did initially by allowing me the chance to paddle across to the island for a foray. 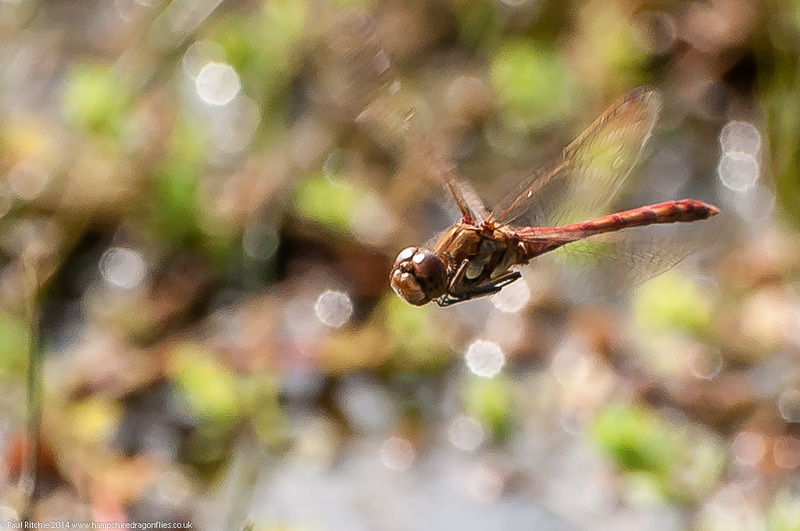 Around the margins of the main pool were plenty of Common Darters, most in tandem. 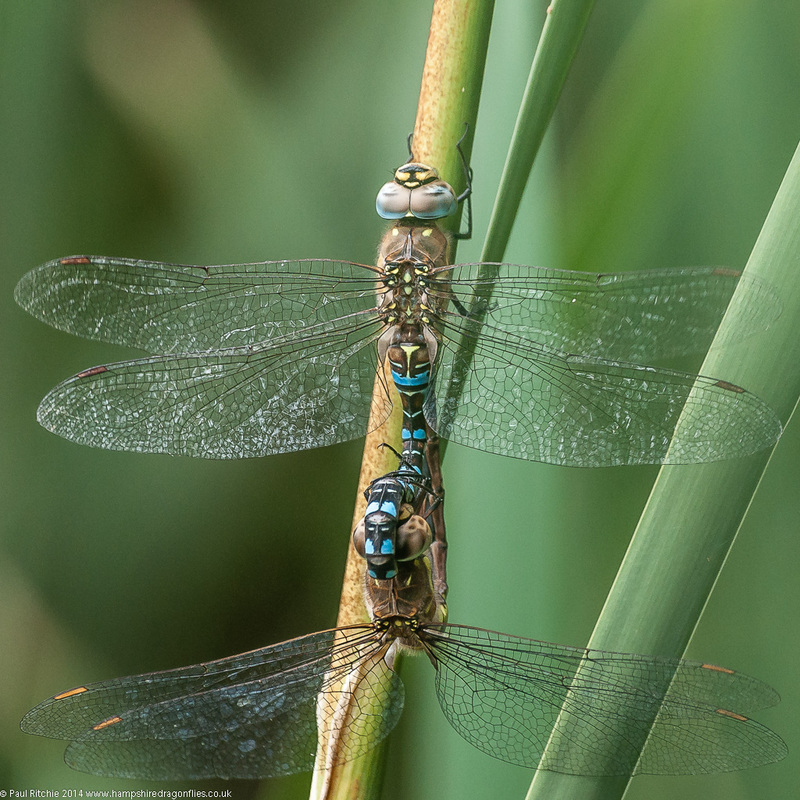 These were punctuated by the odd tired-looking Emerald Damselfly and a few Common Blues, but nothing larger. 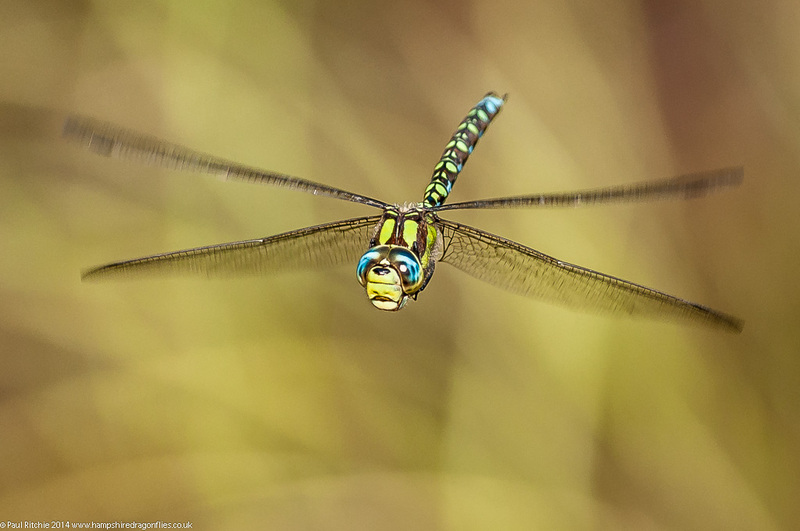 At the boggy pool there were more of the same plus a few Black Darters and, pleasingly, a male Emperor. I stayed here longer than I normally would, hoping for something more, but after the Emperor disappeared under the haze it was only those Common Darters in attendance. I did a quick circuit around Blashford Lakes. 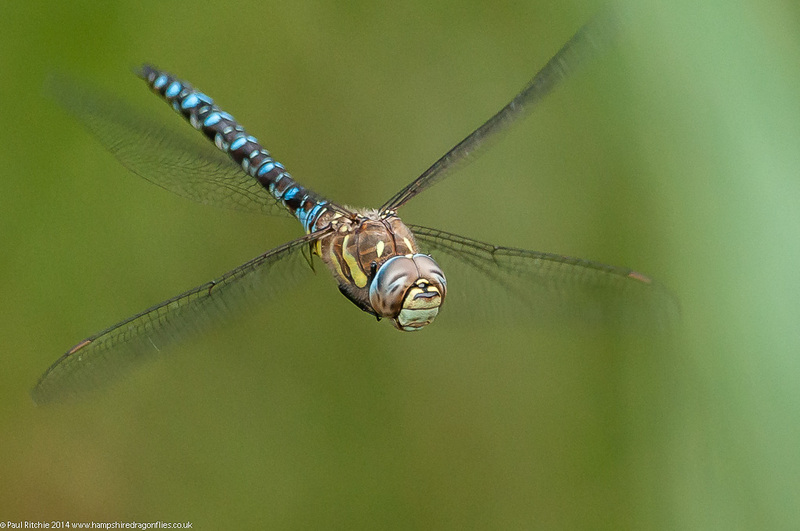 Nothing flying at Ellingham Pound and only Common Darters and Common Blue damselflies decorating the paths, so I proceeded to Ramsdown where the pond finally produced a Southern Hawker for me to get my teeth into. 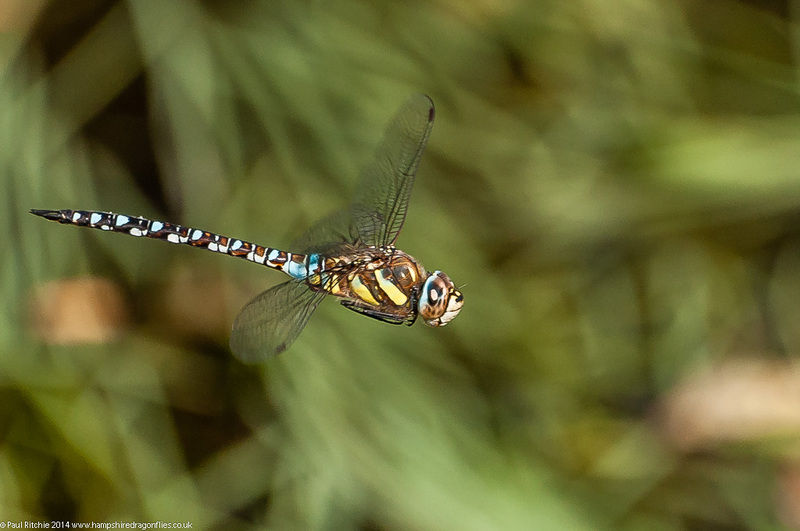 After our excellent experience at Priddy last month, Doug, Sue and I vowed to return in September for more delightful encounters with the Moorland Hawker. Arriving at noon we were immediately rewarded with both Moorland and Migrant patrolling the margins and reed beds. Shortly after this encounter Jerry and Mike arrived along with Steve Balcombe and Max Thompson, proving today was going to be a social occasion as well as a photography one. After initial greetings we separated into small groups to cover several prime spots. Sue, Steve, Max and I concentrating on the boggy western section where there were enough Moorland, Black Darter and Emerald damselfly activity to amuse us, along with a lone Emperor choosing to keep some distance from shore. Jerry and Mike chose the eastern section while Doug hung around at the bridge waiting for subjects to land along the tree line. 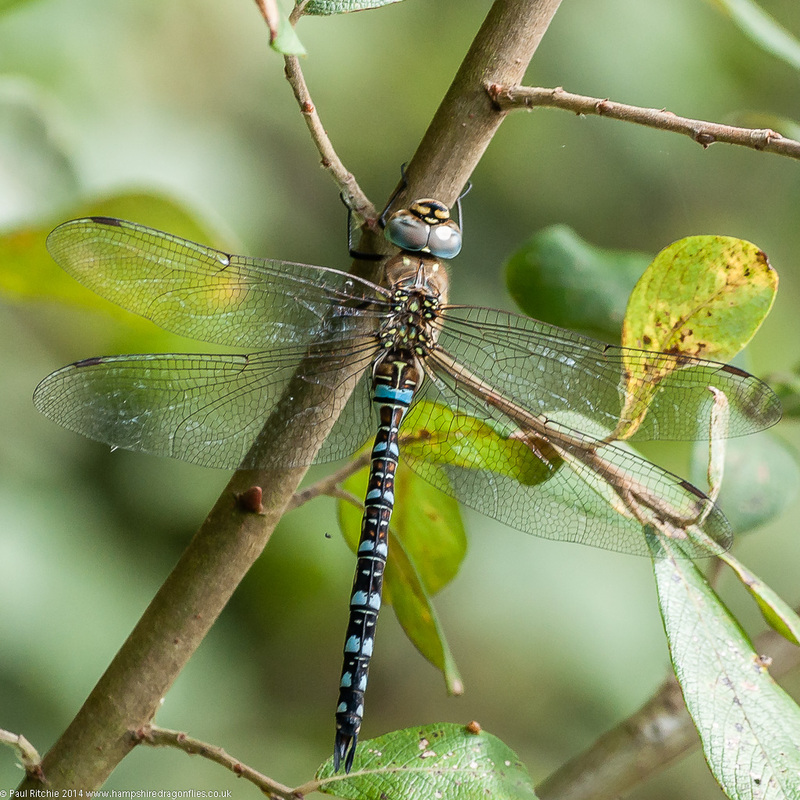 It wasn’t long before a shout came from Jerry that a female Brown Hawker was perched in the ferns, which I attempted to get to but decided to hang around for a Moorland Hawker which Doug had witnessed perch. A little later we were watching a female oviposit into the reeds when a male spotted her and attempted to latch on, taking her over to the grassy bank. What happened next was the female was knocked to the ground, to all appearances looking as if she had been knocked out. It’s likely she just played dead, as I’ve seen a female do the same when being bothered by a Southern. While she was laid out, the male patrolled the grass looking for her. She ‘played dead’ for about a minute before rising where the male once again attempted to lock on. This time the female knocked the male to the ground and while he was down she retreated out of sight. Half a minute later he rose and continued searching for her, flying low over the grass and hovering in the area she had been. I’ve never seen anything quite like this before, and neither had Doug or Jerry. A really superb and educational behaviour moment, and an excellent opportunity for some close in-flights, which we naturally took advantage of. 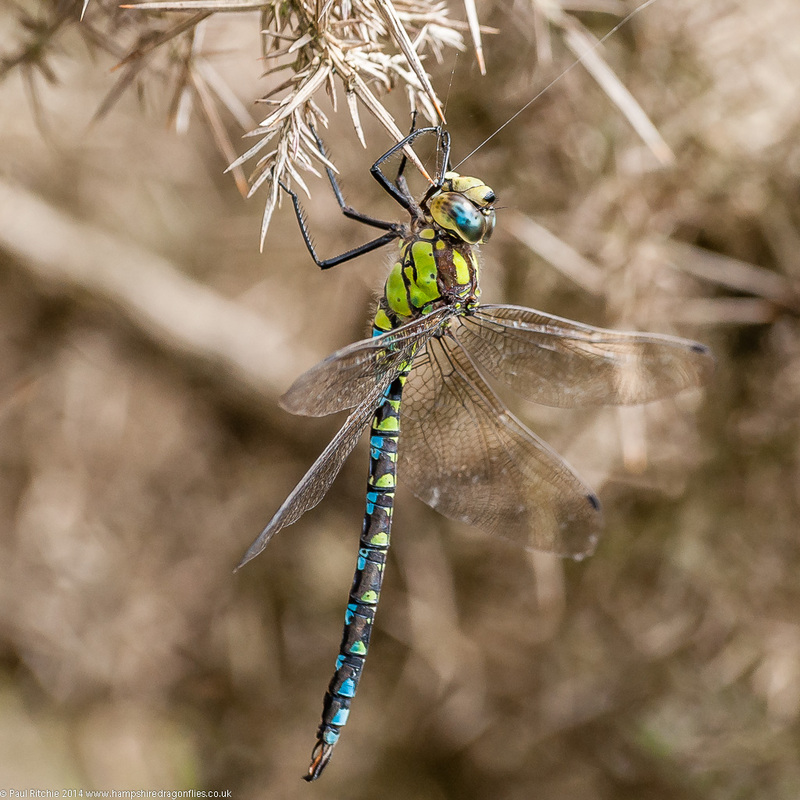 Our next golden opportunity came when Jerry, Doug and I witnessed a pair of Moorland Hawkers rise and land in high up in a tree close by. Thwarted by their position, we took turns lowering the bough to give the other two a chance. 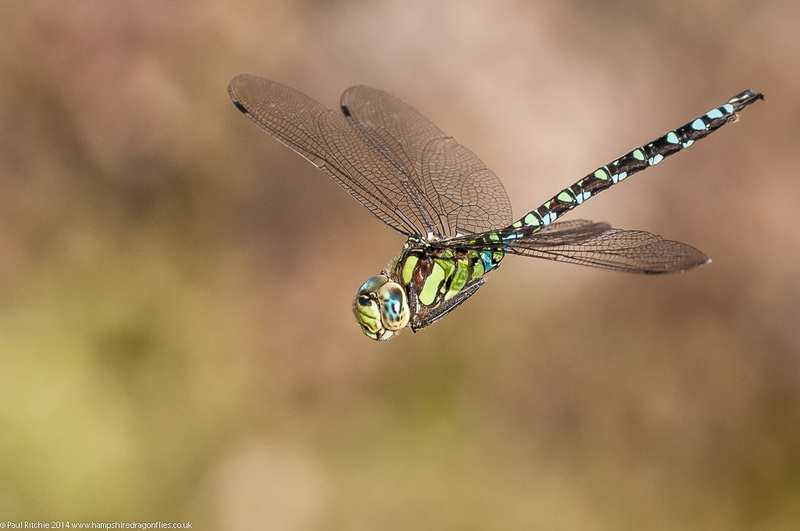 A combination of good company and what seemed like endless opportunities made the time fly by faster than our chosen subjects and we realised it had gone five, but this didn’t seem to bother the hawkers, with Migrant and Moorland still on the wing. 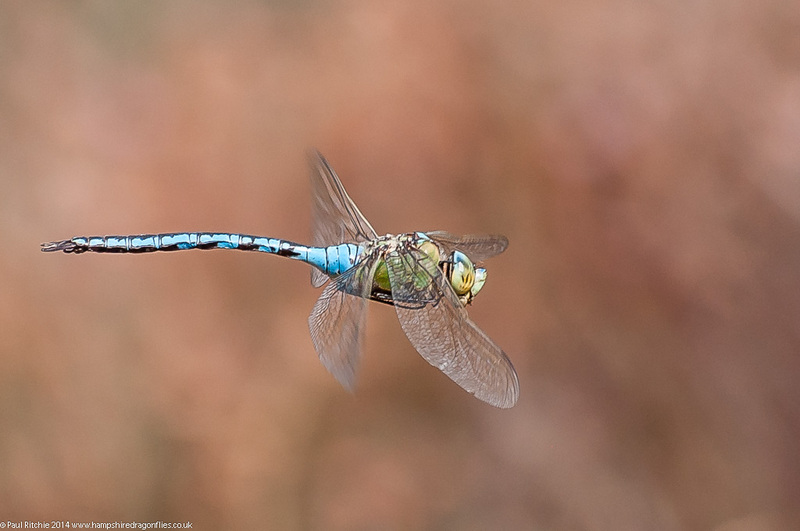 My goal today were perched male, female and paired Moorland Hawkers, and as the song says, two out of three ain’t bad. Besides, it leaves me hungry for next time! Surprisingly I find myself in the (unusual for September) position of having to catch up. I’m certainly not complaining and it makes a change from what turned out to be a frustrating late August. After the fine sporting Wednesday I had, I spent Friday in the company of Doug, briefly looking into Christchurch Common and Ramsdown before giving Dunyeats Nature Reserve a try. It’s a good two or three years since I last visited; pre-wellies if I remember, and the ability to wade into the pond a little certainly paid dividends. We didn’t have the best weather; mostly overcast with the promise of sun, but obviously not warm enough to burn the fog away completely. 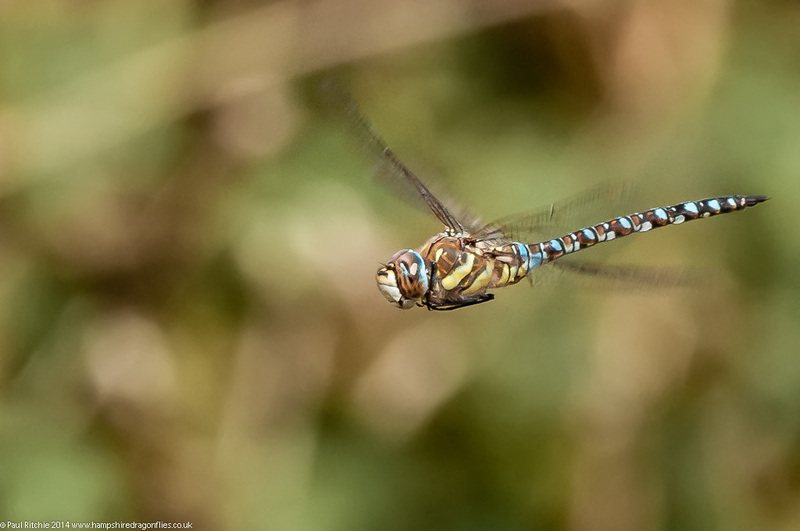 No matter, once the temperature rose we were treated to a fine display of Migrant Hawkers around the patch of Bull Rushes. The day was definitely Migrant heavy, but they certainly provided enough enjoyment. We had a few mating pairs to choose from today, but the Migrants didn’t make it too easy, choosing the deepest parts of the pool. 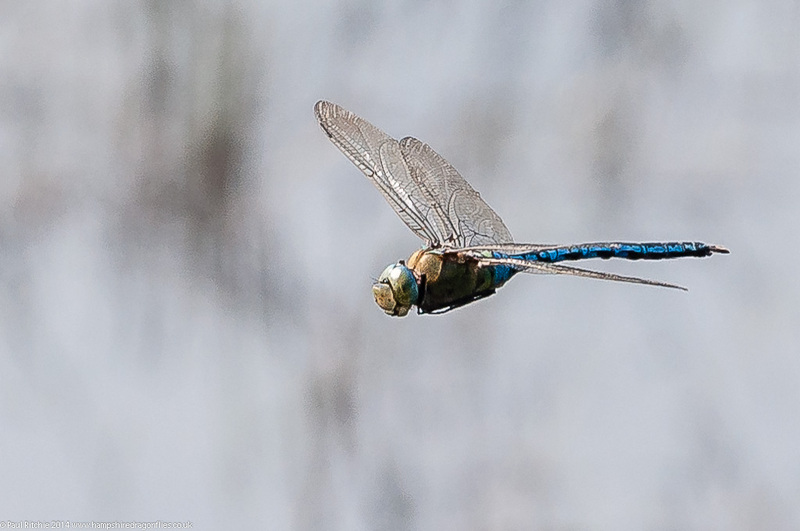 We did have a male Southern visit us a couple of times, but he flew much too close for the lens I had on. No worries, as a female chose to oviposit on one of the many stray logs lying around. 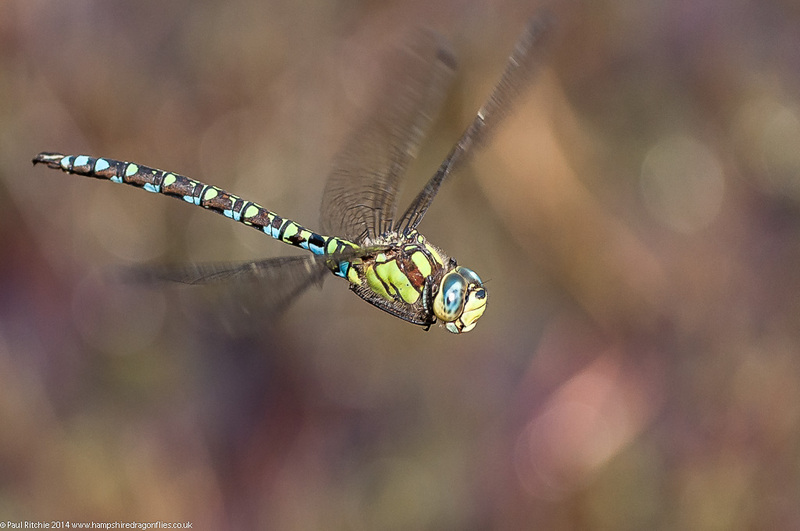 We also have a pairing of Emperors at one stage, but they were far too nervous – rising at our every approach until finally bedding deep down in the treacherous gorse. The best I managed was a record shot, sadly part obscured by a stray piece of grass. All in all a very satisfying day despite the gloom. Apologies if my last post seemed a little less positive than usual. A combination of negative outside forces and disappointing days can frazzle the mind and kill the mojo temporarily. Suffice to say I’ve rallied forth refusing to let these irritants affect the last true fruits of the season. The dawning of September is considered to be the true start of Autumn and a time to reflect on the glorious summer, but I refuse to believe that summer is over just yet. After all, September is prime hawker season. For a change on Tuesday I decided to have another go at gaining access to a prime fishing area along the Avon. 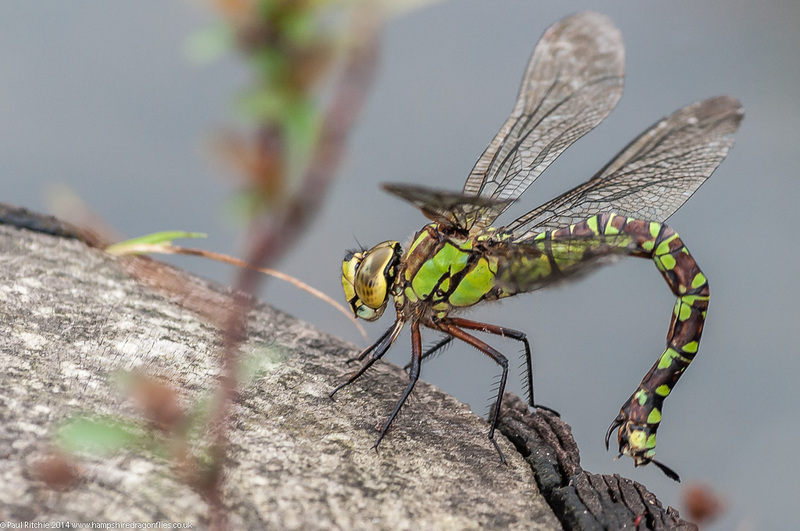 This involved obtaining a permit from a local angling outlet and registering my presence with the fisheries manager, a level of bureaucracy not normally encountered in the search for dragonflies. Nevertheless I persevered and spent a few hours exploring a small part of the area looking for prime Odo spots. 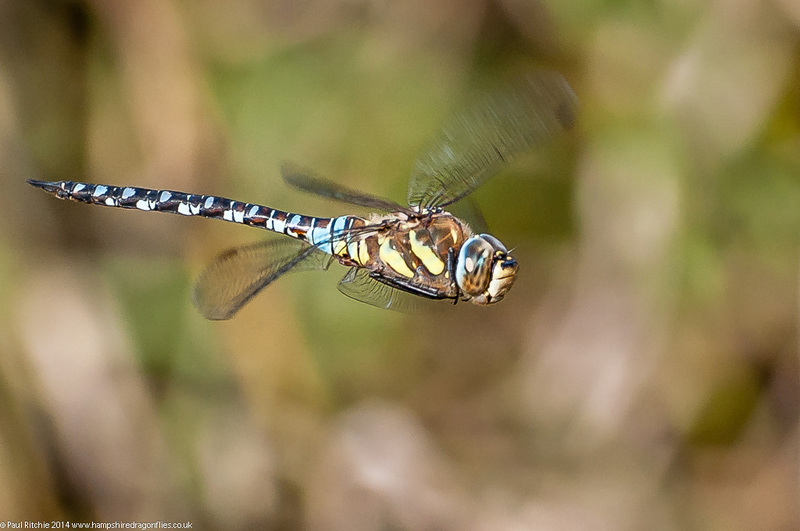 One spot in particular proved to be fruitions when the sun finally appeared, especially for Brown Hawkers. I spent a good deal of time attempting to grab some in-flighters, which I totally failed at. I did however have three good sightings of the resident Kingfisher and a couple of Migrants to play with. 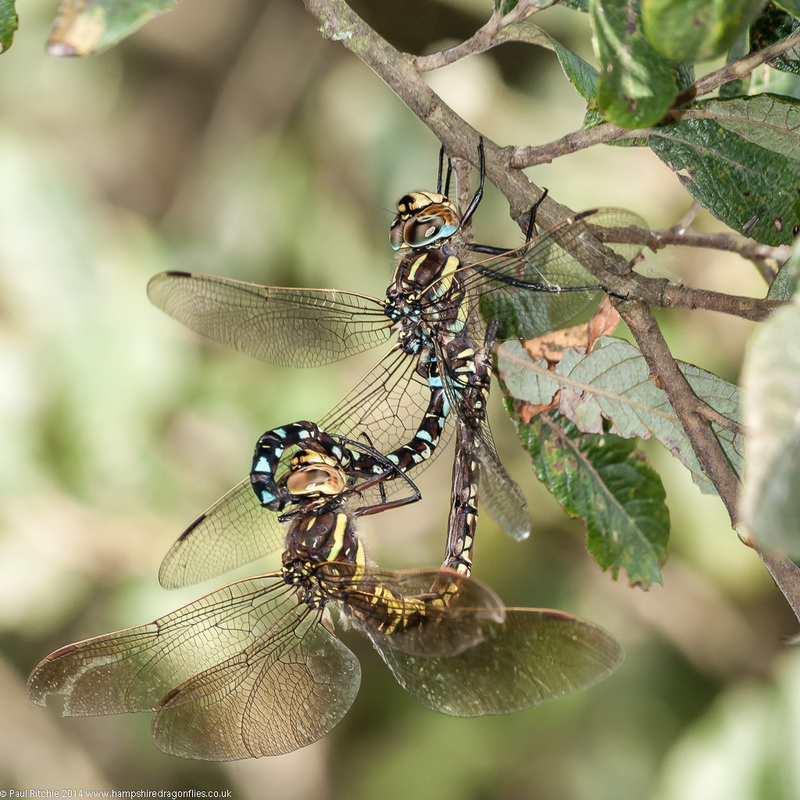 After getting frustrated with the lack of sun, I decided to head out and discovered that the Brown Hawkers were concentrated around a small, sheltered clearing metres away from where I’d spent the last four hours! My passing disturbed one resting Brown who rose and caused a chain reaction with at least a dozen circling in alarmed confusion. I do wonder whether this is a survival technique to minimise the predation. From my point of view it certainly did the trick with me finding it almost impossible to concentrate on one individual. 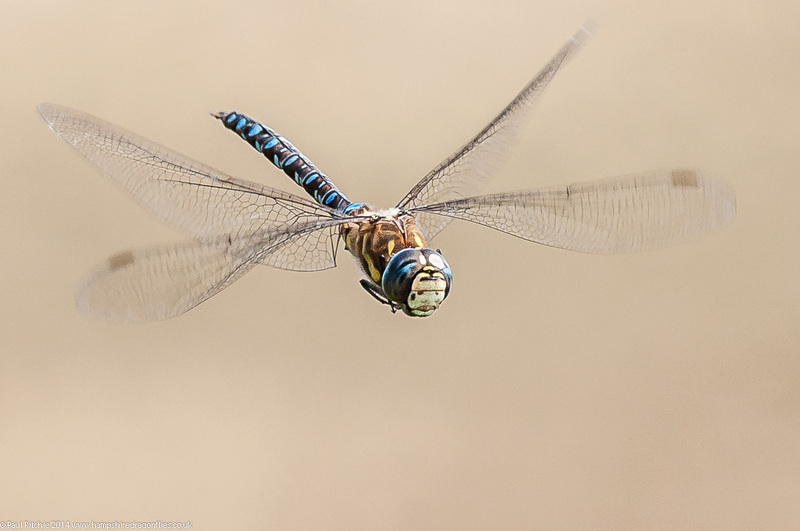 I persevered and attempted to grab some in-flights, but this again proved impossible against the backdrop of trees and bushes, especially as neither showed a flight pattern. And then they all disappeared. They had to land somewhere, but wherever this was eluded me on this occasion, so I admitted defeat and vowed to return to this spot on a more favourable day. A much better day and instead of returning to the fisheries I decided to spend a day at Ramsdown, especially as a chance meeting with Doug pointed me to a Southern holding territory on a pond the afternoon before on the way back. I checked the path at Christchurch Common first, hoping for a few roosters, but this favoured spot didn’t produce any this morning. Onwards then to the new favourite pond where I didn’t have to wait long for a Southern to show itself. I spent a good three hours here enjoying every moment with the two resident Southern and grabbing some much-needed in-flight sport. 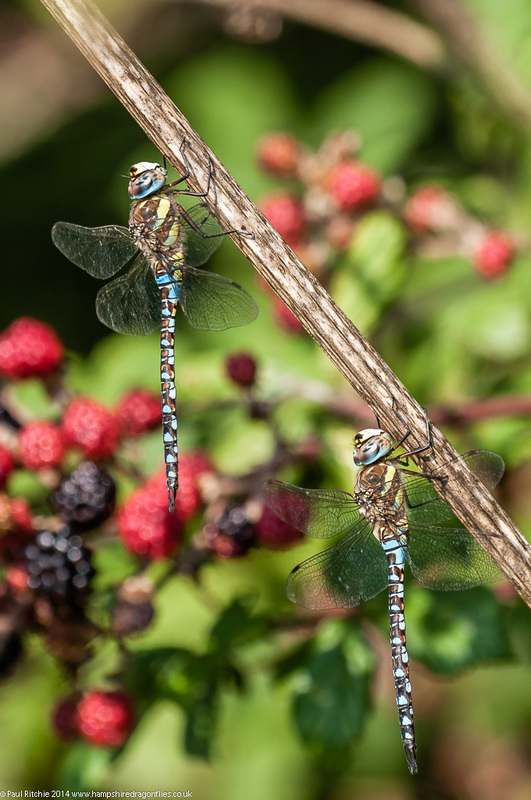 Their wasn’t a Moorland visit today, but these two certainly made up for it, grabbing my full attention despite a\ good presence of Common and Black Darters, Emerald and Common Blue damsels. After I’d had my fill I checked the clearing for feeding hawkers, noticing mainly Migrant on the wing and reluctant to land anywhere near. Still, there was that other Southern to seek out. 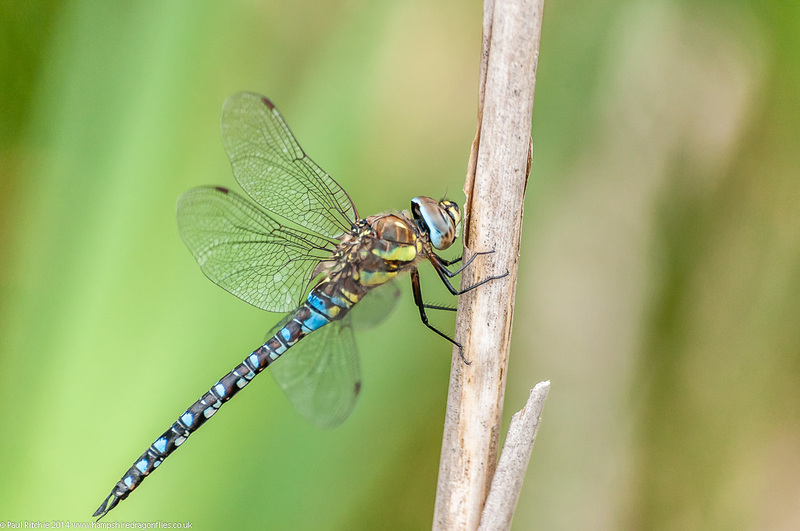 On the way through I stopped at the small heath pond which had recently been replenished to find a resident Emperor. Excellent, as I’d been cheated of the chance for a close encounter at my usual spots this season. 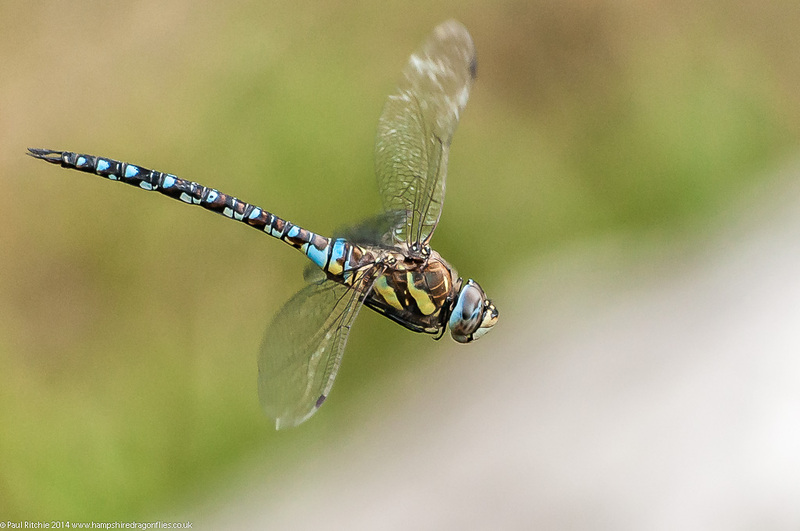 I walked to the centre of the pond and allowed my quarry to get accustomed to my presence and it wasn’t long before he provided a fabulous display of his aerial abilities. I spent a good hour with this delightfully agreeable subject and he allowed me some fabulous opportunities as he circled, retreated and flew in much like an aircraft coming into land before taxiing along before me. Satisfied with my results and grateful for another good hour of sport I went in search of the other Southern which Doug had found, but this fellow wasn’t playing ball at all. I’ve rarely found one this unsociable, choosing the furthest reaches and not once coming to investigate. No matter, I’d had a fantastic day participating in my favourite sport with three most agreeable subjects. 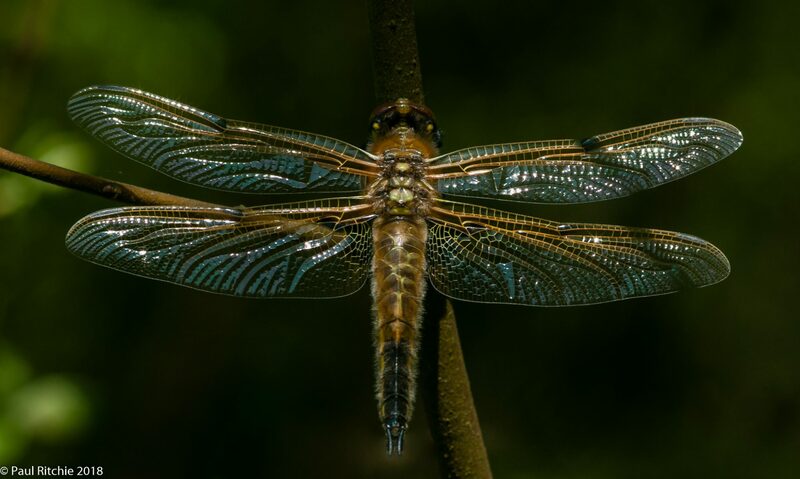 When I first got into dragonflies (and butterflies for that matter) I used to wizz around hunting them down, tiring myself out in the process and probably missing more in the process. I used to get extremely bored staying put at a water body under gloomy skies when nothing was happening. As of this season I’ve learned to stay put in changeable conditions because when the sun does break through everything changes. A perfect example of this was last Thursday. It wasn’t the type of day I’d normally choose to travel for dragonflies, but as I had to drop Sue off at Gillingham in North Dorset, the extra 30 miles to Priddy Mineries seemed worthwhile. I arrived at 9.00am under gloomy skies with a fair breeze, but it didn’t take long for the sun to briefly break through an activity to begin with a couple of Moorland and a few Migrant Hawkers. During the cloudier moments I did a little reconnaissance while keeping an eye on the wide-open skies for the next belt of blue, but for the next hour or so it didn’t look too promising. At around midday Mike and Jerry arrived and were convinced today was not going to be a Priddy day, and instead decided Westhay would be the better option. We arrived in time for the first shower, and the wind was noticeably stronger. 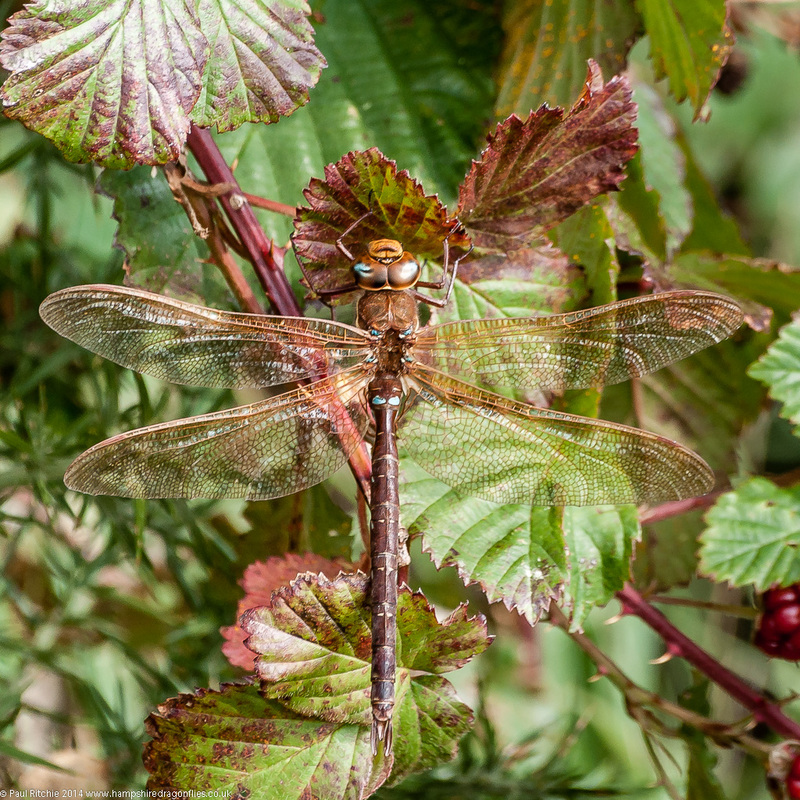 After sheltering the worst in the bird hide, we took a ramble up the path disturbing the odd Common and Ruddy Darter, but it was a while before we found the Migrant Hawkers, in good numbers along the back track. A brief lunch stop at the North Hide before retracing our steps, detouring along the far track for another opportunity. If I’m honest I was getting a tad bored with Migrants, as beautiful as they are, and was grateful for a change of species, and a Ruddy (found by Mike) provided a welcome opportunity. 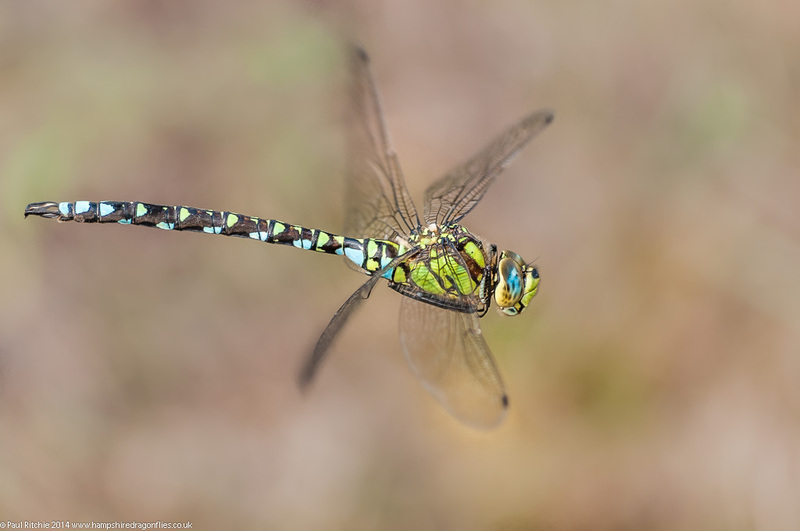 We did have a male Southern Hawker on the way out who didn’t stay around to be photographed, and unsurprisingly more Migrants, and decided to wrap up at 3.30pm. During our walk around the site I couldn’t help wondering what was happening at Priddy, especially as you could see the weather over the hills from our valley position. I decided to call in on my way home and sure enough, despite the cloud cover, there were several Moorland Hawkers patrolling the far bank. 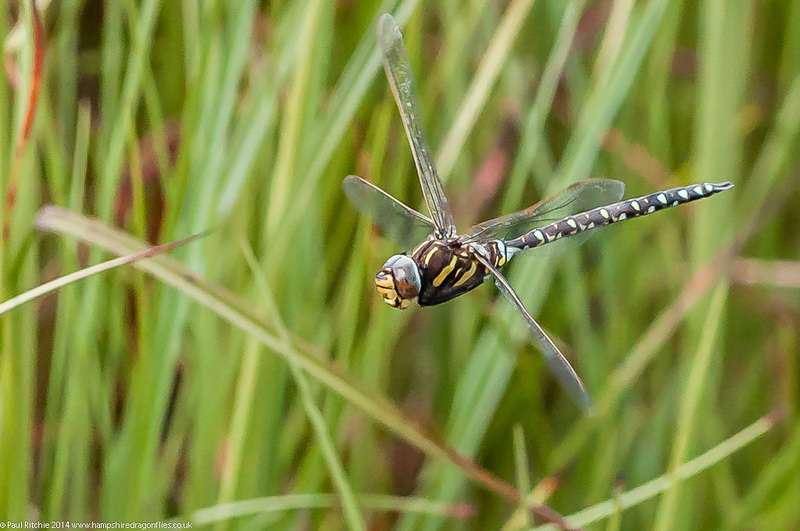 There were also a couple of females choosing to oviposit deep in the reeds beyond their (and my) reach. I stayed until the last one left at around 5.00pm and vowed to stay put on my next visit.